Bristol, England, world's first shot tower. British forces had been issued lead shot for their muskets but because of imperfections in manufacture, much of it suffered from pockmarks on the surface, making it inefficient and even dangerous. Then in 1783, William Watts of Bristol, UK took out a patent for his new technique, a process "for making small shot perfectly globular in form and without dimples, notches and imperfections which other shot hereto manufactured usually have on their surface". Up until this time shot had been produced in 8-10 cavity molds. This very time consuming. What's the shape of a falling raindrop? We like to sketch raindrops with a tear-drop shape. Actually, they're spherical. Once they've fallen far enough, surface tension has pulled them into the shape with the least surface. That's a sphere. In 1782 an English plumber named William Watts saw possibility in that. He realized that if he dropped molten lead far enough through the air, it, too, would form into spheres. The surface tension of lead is a lot higher than that of water, so it forms very perfect spheres indeed. He saw that he had a new way to make buckshot. Watts went back to his brick row house in Bristol and began adding floors to it. It was already three stories high. He doubled that, He put some castle-like trim on the top and called the design Gothic. He wanted his neighbors to like the addition, but the real action was inside his strange new home. He knocked holes through each of the floors inside and put a water tank at the bottom. At the top, he poured lead into a sieve. The lead formed into spheres as it fell six floors. By the time the drops hit the water below, they'd started to solidify. The water caught and cooled them the rest of the way. Up to then, most shot was cast. That was very labor-intensive. Shot was also made by pouring lead into a sieve over a barrel. That really did give tear-shaped drops. Before Watts, no one had yet realized that a much longer fall would give spheres. Watts saw how he might greatly cut the cost of making high-quality shot. Then he gambled his home that it would work. And it did. Shot towers like his sprouted all over England and Europe. Yet the process changed little. Shot makers added an up flow of air, and they invented ways to sort out deformed shot. Yet Watts old patent still gave a pretty good description of 20th-century shot-making. In fact Watt's old house -- his original shot tower -- kept producing shot until 1968. Watt's invention teaches us the two essential elements of good invention. The first is perception. Watts gazed more closely at nature and saw what other people had missed. The other element is simplicity. Others had labored to control the process with their own hands. Watts had the grace to stand aside and let nature do the work for him. The real beauty of this process is that, in the end, there is no human process at all. In 1807, Thomas Jefferson had congress pass the Embargo Act of 1807 which forbade all international trade to and from American ports, and Jefferson hoped that Britain and France would be persuaded of the value and the rights of a neutral commerce. This was the end of importing lead shot from England, France and the rest of Europe where shot towers produced tons of shot for American export. European shot towers had sprung up all over Europe after the construction of the first shot tower by William Watts in 1783 in Bristol, England and the American colonies were major buyers. With this turn of events (Jefferson's embargo), shot towers began to be constructed in the colonies for American consumption. The first two were in Philadelphia (Sparks Shot Tower) in 1808 and the Jackson Ferry Tower in Wytheville, Virginia in 1807. Both these towers produced shot and bullets for the War of 1812. The Sparks Shot Tower in Philadelphia is the first "smoke stack" type tower in America. The tower produced tons of ammunition during the War of 1812 and the Civil War. Four generations of the Sparks family kept the tower in operation until 1903. The tower is now part of a city playground with a recreation center at the base. It's a prime example of Philadelphia's reputation for superb brickwork. The operation was completely above ground while the Jackson Ferry Tower in Wytheville, built one year earlier, has much of it's drop underground. The combined drop (above and below ground) of the Jackson Ferry Tower is 150' with the above ground rectangular tower standing 75 feet and the underground shaft another 75 feet. In 1774 Thomas Jefferson purchased 157 acres of land including the Natural Bridge in the Shenandoah Valley of Virginia from King George III of England for 20 shillings. Later, Jefferson himself used the "Watts Method" of making shot by dropping molten lead from the top of the Natural Bridge into the stream below. That small stream is Cedar Creek. 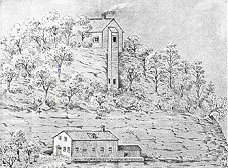 Early shot towers where found in the New England states in the early 18th century and flourished in New York, Pennsylvania and Virginia, where they were used in the manufacture of lead shot for shotguns. An example of a shot tower was the Youle Shot Tower, built around 1830 on the banks of the East River, beyond Kip's Bay on Manhattan Island in the state of New York. The owner, George Youle, was a dry goods merchant. This particular shot tower operated for years and was quite productive, selling much of its inventory to hardware and sporting goods dealers in New York and Pennsylvania. In turn, the dealers supplied the Indian Bureau, the American Fur Trade and a number of suppliers in the south and west. Other famous shot towers include the Collier Shot Tower in St. Louis, Phoenix Shot Tower in Baltimore (1828), the Chicago Shot Tower, the Remington Shot Tower in Bridgeport, CT (1909), the Jackson Ferry Shot Tower in Wytheville, VA (1807), the Sparks Shot Tower in Philadelphia (1808), the Peters Shot Tower in Kings Mills, OH (1895), the Selby Shot Tower in San Francisco (1864), the Dubuque Shot Tower in Dubuque, IA (1856), the St Louis Shot Tower in St. Louis (1830) and the Winchester Shot Tower in New Haven, CT. When one considers the small size of shot and compares the size of the building and lofty tower devoted to its operation, the proportions are quite distorted. The apparatus for manufacturing shot was merely a plate of copper with a number of holes punched in it and placed a few hundred feet above a water source at the bottom of the tower. The melted lead was poured, passing through the holes in the plate (sieve) and than falling into the water at the bottom of the tower. This process cooled, formed and hardened the liquid molten lead into perfect shot, all in one operation. This is known as the "Watts Method." New York still had three shot towers in operating as late as 1868, but not long after that the new "Wind Tower" method, using a short fall against a blast of cool air made them obsolete. By 1873, the Youle Shot Tower was the only surviving shot tower in New York. It no longer stands. What's the future of American Shot Towers? The idea of a shot tower as a monument was never found to have the same attraction as those towers of light-houses or ones found at stone forts on the frontier, and many of them were torn down. However, in recent years, the towers in Baltimore (Phoenix) and Virginia (Jackson Ferry) have become great tourist attractions. The Sparks tower in Philadelphia has been preserved and is in wonderful condition. The most endangered tower is the Peters Shot Tower in Kings Mills, Ohio. Probably the most beautiful tower, it's days are numbered. Tragically, the Watts Tower (first in the world) in UK was destroyed in the 1980s. The Jackson Ferry Shot Tower was typical of others in the country that made small spherical lead shot for the fowling pieces of frontier settlers. Smelted lead from the nearby Austinville mines was melted at the top of the tower and poured through a sizing sieve to produce small droplets. Surface tension caused the molted lead to assume a spherical shape that solidified during its 150-foot fall. The shot was then collected in a water-filled kettle at the bottom of the shaft. The "drop process" was patented in England in 1769 by William Watts, a craftsman of Bristol, England. He profited handsomely from its prevalent use. The tower was built by Thomas Jackson, an English immigrant, in 1807. The tower and grounds were restored through the efforts of local organizations, individuals, and the Commonwealth of Virginia. Perhaps the most famous shot tower remaining is the Phoenix Shot Tower in Baltimore, Maryland. Erected in 1828, the tower is the last of four in Baltimore that were used for making shot, or lead pellets, used as ammunition in muskets. The shot was made of molten lead that was heated by furnaces inside the tower, poured through sieves at the top and dropped into tanks of water near the base. The building is considered an engineering marvel because it took more than one million bricks to construct; it was erected in less than six months without the use of exterior scaffolding, and it stood as the nation's tallest structure for nearly two decades. When the building was threatened with demolition in 1921, a group of citizens bought it and gave it to the city for preservation. At its peak, the tower produced up to 500,000 25-pound bags of shot a year, making it one of the nation's largest suppliers of ammunition. It operated until 1892, when rising costs forced the owners to abandon it. Shot Towers were not uncommon in 19th century skylines. One of three in Baltimore was built on the corner of Fallsway and Fayette St. in 1828. 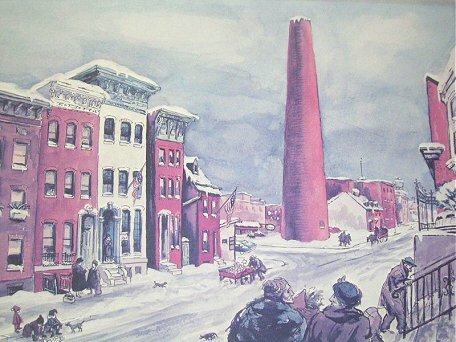 The Phoenix Shot Tower Company of Baltimore constructed it without the use of scaffolding. Charles Carroll of Carrollton laid the corner stone. Molten lead was dropped from the top of the tower. As it fell, it formed balls. Water at the bottom would catch and cool the shot. The tower and surrounding plant was acquired by the Merchant's Shot Tower Company, who manufactured shot there until 1892. Union Oil bought the factory in 1921 with the intention of tearing it down and building a gas station in its place. Public outcry saved the tower, and the gas station was built along side it. In 1924 Union Oil gave the Shot Tower to the city. It was restored in 1976 and opened to the public as a museum. The Phoenix Shot Tower was a lead shot manufacturing facility that was in operation from 1828 to 1892. Molten lead was dropped from a platform at the top of the tower through a sieve-like device and into a vat of cold water. When hardened, dried and polished, the shot was sorted into 25-pound bags. Over 234 feet in height, the Shot Tower was the tallest structure in the United States until the Washington Monument in Washington, DC was completed after the Civil War. The Shot Tower was designated a National Historic Landmark in 1972. It looks like a smoke stack with a lid on top, but it's really America's first shot tower built in 1808. Shot towers revolutionized the making of musket balls and other solid projectiles based on the principal that molten lead will form perfect round balls when poured from a high place. Until this discovery, gun shot was made by pouring the lead into wooden molds. Plumber Thomas Sparks and a partner created a 142-foot-high brick tower with a 30-foot circumference at its base tapering to 15 feet at the top. It stands along the Delaware River waterfront at Carpenter Street in South Philly and is easily seen from Route I-95. The 160 feet tall lead shot tower is located on the banks of the Shropshire Union Canal in Chester, UK. It was built just prior to the Napoleonic War in 1798 or 1799. It is still in perfect working order, although production has sadly ceased, it being uneconomic in comparison to today's modern shot. The tower used an interesting technology: previously, molten lead was poured into moulds and left to harden. The resulting shot was, however, not uniformly perfect, and the guns would occasionally jam and could explode in one's face. The tower method involves pouring molten lead through a sieve from the top of the tower. As it falls it forms perfect balls of shot, hardening as it falls and finally dropping into tanks of water at the bottom. The diameter of the shot is determined by the size of the sieve, with larger size shot needing further to fall to complete the 'rounding' process. It is a marvelous building, with its walls some three feet thick. The top of the tower can sway considerably in high winds, sometimes causing the falling lead to miss the tank of water at the bottom! It is because of this flexibility however, that the tower is still standing; had it been rigid it would undoubtedly have fallen by now! One of the most beautiful shot towers in the word can be found on the bank of the Derwent River in Australia. This stone shot tower was completed in 1870 by Joseph Moir�, a native of Kelso, Scotland. The tower is the only circular stone shot tower in the southern hemisphere. The tower contains 318 steps and 25 landings to the drop room at the top of the tower. As St. Louis' industries grew and the town was exploding with population along with outlining settlements involved with the Westward Movement, it was only natural that a shot tower was needed to fill the demand. Ferdinand Kennett saw the chance for an enterprising person to become wealthy and with partners like his brother Luther and James White it wasn't long that his dream was fulfilled. By 1836 the Saint Louis Shot Tower Company had purchased the J. H. Alford Company, it's warehouse and shot tower in Herculaneum and by 1840 formed a partnership with John Latty to make shot and form a new company - F. Kennett & Company. The company had become a co-partnership as it expanded with several silent and named partners, by 1854 Ferdinand Kennett had completed his dream and retired an exceptionally successful man. 79,775 bags or 1,994,375 pounds of varied sizes of shot and round balls. 1714 bags or 428,460 pounds of lead bars. A total of shot and lead in five months or 2,422,835 pounds. The hexagon smoke stack style Youle Shot Tower was built in 1823 on the banks of the East River, beyond Kip's Bay on Manhattan Island in the state of New York. The owner, George Youle, was listed as a dry goods merchant and builder of the shot tower in Longworth's New Directory for 1835-1836. His first tower, built in 1821 collapsed. His second tower was so strong that demolition was difficult a hundred years later. It was the third shot tower built in America after Jefferson's 1807 Embargo. The shot tower operated for years and was quite productive, selling much of its inventory to hardware and sporting goods dealers in New York and Pennsylvania. In turn the dealers supplied the Indian Bureau, the American Fur Trade and a number of suppliers in the south and west. One of those suppliers being the Tryon Company of Phila. 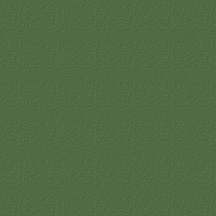 PA, the same manufacturer of the Tyron trade gun and Tryon rifle, along with cutting tools and general hardware. When one considers the small size of the product manufactured and compares the size of the building and lofty tower devoted to its operation, the proportions are greatly distorted. The apparatus was merely a plate of copper with a number of holes punched in it and placed a few feet above a kettle of water in the tower, the melted lead was poured, descended and passing through the holes in the plate into the water, cooled and hardened all in one operation. Probably the hardest part of the manufacturing of shot was moving the material from the ground to the top of the tower and into the furnaces at that location, many accidents have been recorded at this area, thus workers in the upper part of the tower received more for their daily wage than those working at ground level. The idea of a shot tower as a monument was never found to have the same attraction as those towers of light-houses or ones found at stone forts on the frontier, a shot tower was a place of unbelievable heat, hard work and bad air to breathe. Selby Shot Tower owner Thomas H. Selby arrived in San Francisco from New York in 1849 and became its mayor twenty years later. By 1870, his 200-foot-tall shot tower at First and Howard was already as prominent a contributor to San Francisco's burgeoning industrial economy as it was to its skyline. From the time of his arrival, Selby engaged in mercantile pursuits, notably as a successful importer of metal and hardware. More important, in 1856, he established the Selby Smelting and Lead Works, building the first such large endeavor in the American West. The Smelting and Lead Works became the city's most prestigious industrial enterprise. In a little more than a decade, ores from every state and territory west of the Rockies were sent to San Francisco for smelting. Ultimately, with 40 furnaces, the Selby works became the largest reduction establishment on the North American continent, consuming almost all the lead bullion produced in the United States. The plant, situated on Jefferson Street in North Beach, was on the extreme northernmost point of The City, extending out into the Bay and facing Alcatraz. Around the clock, smokestacks, the loftiest of which was 80 feet high, spewed out columns of dense black smoke creating a constant pall over the Bay to the east. At night, light from its furnaces revealed the plant's never-ending labor. At First and Howard streets, Selby constructed a lead-pipe and shot works. The structure, which for a quarter of a century was a noted tourist attraction, included a 200-foot-high shot tower for the manufacture of lead bullets. Molten lead, dropped from the tower, passed through a series of sieves into water below, creating shot. During World War I, Bridgeport exploded with activity. Even before the United States entered the war, the city's manufacturers found a ready market in the European combatants. A leader in the industry was the Remington-Union Metallic Cartridge Company, which more than doubled its plant size between 1914 and 1916. At the center of the main Remington plant stands a slightly older building that played an important role in the munitions buildup: the 10-story brick shot tower built in 1909. In 1908, the cost of the shot that the company bought for use in its cartridges suddenly increased. The plant manager suggested to Remington's CEO, Marcellus Hartley Dodge, that the company build a tower and produce its own shot. Dodge agreed, but didn't want to risk the company's resources on what might be a risky venture, so he financed the tower himself. He insisted that it be not only functional, but attractive as well, referring to it as a "campanile" for Bridgeport. The resulting tower begins with a six-story base that has a hipped roof. Above the roof rises a four-story tower, its top now bristling with cell phone antennas. In silhouette it looks like a stretched-out version of an Italianate house. Wide windows provide ample light for the interior, while cast-stone trim that culminates in a balustrade at the top, fulfills Dodge's requirement that the tower be a civic ornament. The shot-making process is described in a report written when ammunition was still being produced at the site: "On the top floor are two kettles to melt the lead alloy, which is then piped into two steel pans with pin-holed bottoms. The shot, formed as the molten alloy passes through the holes, falls 133' to water tanks below, from which it is conducted back up to the ninth floor by a bucket conveyor. From there it travels down, fed by gravity, through a series of operations: sorting for roundness and size, cleaning, polishing and applying graphite." During World War I, Bridgeport exploded with activity. Even before the United States entered the war, the city's manufacturers found a ready market in the European combatants. A leader in the industry was the Remington-Union Metallic Cartridge Company, which more than doubled its plant size between 1914 and 1916. Twenty years before Wisconsin became a state, the discovery of vast lead deposits brought a population boom to the area. Green Bay merchant Daniel Whitney organized the Wisconsin Shot Company to built a shot tower. T. B. Shaunce dug out the shafts with pick and gag (pry bar) and removed the earth with buckets. Men like Daniel Whitney and Shaunce worked with humble tools and crude methods. Molten lead was dropped from a building on top of a large cliff through sieves, and then collected through an exit tunnel at the base of the cliff near a branch of the Wisconsin River.